Give your kitty some excitement and exercise with this wand toy featuring a retractable feather to appeal to her prey-hunting instincts. Made from durable plastic and metal, this cat toy includes a laser to vary the fun. My cat loved this toy the best out of all of the Jackson Galaxy line. 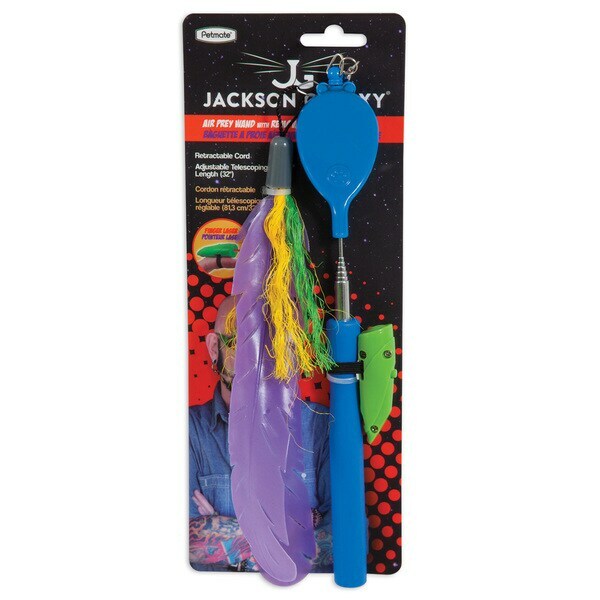 It has a telescoping handle and the feather is attached to a retractable wire which you just push a button to activate. The laser pointer is a great extra, you can keep it on the wand or remove it and use on your finger as it has an elastic loop attached to it. Great toy. Really cool cat toy! My cat ,Biggie loves feathers and I've always worried about him ingesting them. The faux plastic feathers on this toy are genius. They are very realistic! The design of this toy, with it's retractable wand, is wonderful. Biggie has become a masterful hunter! I think anything created by Jackson Galaxy is well worth the money. This toy is really sturdy for a crazy 6 month old kitten play time. The feather on it is actually a thin plastic material, not an actual feather. My kitty loves it! My cat Oreo has so much fun with this cat toy. Any Cat toy he gets, he enjoys and makes him fire out, which is great when you want to make him tired. This is an excellent product. I've spent hours playing with my cat with this cat toy. He never gets bored with it. It is surprisingly sturdy in that my cat has not destroyed it yet. My cats were bored with all the toys they had. I was looking for something to keep them entertained. My husband wanted to interact more with the cats so this toy was perfect. I love this toy playing with my Bradley and Heather they love it too they have already broken off a few feathers they play rough and usually destroy most of their toys! I saw it in the TV show " My Cat from Hell".